"The most pointless exercise on the planet has got to be this four-wheel-drive 1000 horsepower Bugatti. I think it's incredibly childish this thing people have about just one element—top speed or standing kilometre or 0-60. It's about as narrow minded as you can get as a car designer to pick on one element. It's like saying we're going to beat the original Mini because we're going to make a car 10 mph faster on its top speed—but it's two foot longer and 200 kilos heavier. That's not car designing—that just reeks of a company who are paranoid." That's McLaren F1 designer Gordon Murray talking about this week's Fantasy Garage candidate during it's incubation period. And I told you, this time it would be another Volkswagen. A Bug, even. Hatched almost entirely from the mind of the same madman who brought us last week's disgraced Phaeton W12, the Bugati Veyron is without question a high-water mark of automotive engineering. Can I rephrase that? The 16.4 is the high-water mark. And no matter what any of you say, this one's going into the Garage. The Votes Are In: Phaeton, Out! "One really good thing, and I simply never expected this, is that it does change direction. It hardly feels its weight. Driving it on a circuit I expected a sack of cement, but you can really throw it at tight chicanes." Sure, there will be some who say that the half as heavy (and half as powerful) Ferrari F40 feels better through the twists than the Veyron. But of course, a decent Se7en makes the F40 feel like a potted plant. And that's the thing with the Veyron – what the hell do you compare it to? Any other car is, well, an apricot. Through our eyes, it is easy to see why Piech dreamed up such a superlative car. Look, we aspire to one day, maybe, somehow, imaginary sky-god willing, own a Lamborghini. Piech owned Lamborghini. And Bentley, Audi, VW, Skoda, Seat and Bugatti. What's a guy to do? Sit back and build yellower Murcielagos? No way. Remember who Ferdi's grandpappy was (Dr. Porsche). No, he needed to not just push the performance envelope, but smack it. With an A-bomb. A curious side-note, Piech has thirteen-children through four different women. Or maybe that's not a side-note at all? While Piech may have announced the Veyron "officially" in Switzerland, Volkswagen had been hard at work on the car for over two-years. Remember the butch but ultimately ungainly Hunaudieres concept from Bentley? Not only was it similar in appearance and structure to the Veyron, but it ran the world's first W16 engine. 1999 also saw the EB 18/4 Veyron concept unveiled in Tokyo. Very little changed externally between that concept and the final Veyron, though, obviously, the massive 18-cylinder true-W mill was dropped in favor of the more Bruce compact, faux-W, 16-cylinder VR engine. That was hardly the half of it. It is one thing to travel at 250+ mph. it is another entirely to do so safely. As evidenced by the two Veyron prototypes that crashed during development. Piech retired in 2002 and the wishful 2003 launch date was pushed back to 2005. New VAG-kingpin Bernd Pischetsrieder replaced Hartmut Warkuss, the Veyrons' original daddy, with Dr. Thomas Bscher. It was Bscher who finally delivered the goods. And what great, heaping, mental-patient strength goods they were. See, the Veyron may sell for a cool 1 million euros (about $1.35 million), but each car costs Bugatti close to $10 million to make. Which, from a certain perspective, is a hell of a deal. Do we even need to get into the technical stuff? Really? Can't I just play you that James May video or something? No? OK, the Veyron has an 8-liter W16 that features four air-to-liquid cooled turbochargers. Production engines are exceeding Piech's initial claim of 1,001 hp to the tune of 1,040 hp. Torque is I-hate-stumps-stupid; 923 lb-ft to be exact. You'll also get a seven-speed DSG, Haldex AWD and 8-piston, 15.7" carbon-ceramic, turbine-vented brakes. Oh, and the moveable wing creates 0.5 Gs of stopping power. Hell, in case the regular brakes fail, even the handbrake has ABS. Every body panel but the doors are made of carbon fiber (the doors are aluminum). The central tub is carbon fiber, while the front cradle is aluminum space frame and the rear chassis is heat-resistant tubular stainless steel. You really want more? Yeesh. Well, the Veyron has ten radiators (three for cooling the engine, one heat exchanger for the air to liquid intercoolers, two for the air conditioning system, one for transmission oil, one for differential oil, one for engine oil, and most amazing/decadent of all, one radiator that does nothing but cool the hydraulic oil used by the spoiler. ('Cause you just gotta have that. ) The Veyron also has modes. And not simply "comfort" and "sport." No, the ultimate road car actually changes shape. Trips to 7-11 are handled relatively conventionally in "normal" mode. The wing is tucked neatly into the car's rump and ride height is about five inches off the gravel. Pretty cushy, especially as you will be nearly swaddled in leather as you munch down on your 1/4 Pound Big Bite. Should you hit more than 130 mph between stop signs – which is dumb-easy to do – the car transforms into "handling" mode. Configured like this, the suspension drops the car down by nearly two inches and the wing extends, revealing a separate spoiler. Even more shape-shifting takes place out of sight. Two flaps, under the car and ahead of the wheels, open up. Working together, handling mode creates nearly 800 pounds of downforce, sticking the Veyron to ground like chewed gum all the way up to 230 mph. Obviously, that's just not fast enough! Enter "top-speed" mode, which is akin to KITT's Super-Pursuit Mode. Only, you know, real. While the Veyron is idling, the driver inserts a second key into the floor, alerting the car it is nearly time to go batshit. In this guise, the Veyron's knuckles drag even closer to the ground (about 2.5 inches). The wing is almost fully retracted – it pokes up at a totally precise 2 degrees. The hidden flaps are closed. All this tom-foolery reduces the drag coefficient from a brick-like 0.41 to a slicker 0.36. Downforce plunges to just 120 lbs. And yes, for 12 minutes, you can blast across the planet at an electronically limited 253 mph. And then the Bugatti is out of gas. 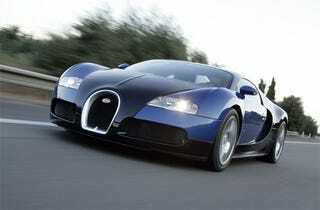 Though, should you so much as tap the brakes or turn the wheel in top-speed mode, the Veyron reverts to handling mode. And now the numbers. Let's start with braking, as the Veyron's stopping power is lunatic-level bonkers and on par with its acceleration. Simply lifting your foot off the gas at top-speed produces 0.3 Gs of stopping force. Standing on the pedal will produce over two earths' gravities worth of stop. Bugatti claims the Veyron will come to a standstill from 253 mph in less than 10 seconds. Think about that for a moment. If a world-class sprinter were to begin the 100-meter dash at exactly the moment a balls-out Veyron began braking, he would reach the finish line at the same time the Bugatti ceased moving. Though the Veyron would be seven or so football fields further down the road. We're not sure what this means, either. Except that cars like this demand analogies that defy sense. Aside from being the fastest production car the world has ever seen (what's up, Ultimate Aero TT? ), the 16.4 is also the quickest. 60 mph is dispatched with in 2.64 seconds. And remember, this is an AWD car that weighs 4,300 lbs. Zero to 100 mph? Six seconds flat. 0-150 mph? Eleven seconds flat. 0-200 mph? 22 seconds flat. Just to give you some perspective, a McLaren F1 needs 28 seconds to hit the double-ton. Amazingly, only 55 seconds are needed to hit 253 mph. At which point you are eating two gallons of gas per minute. Which is simply fantastic. In fact, with the exception of being really ugly, I can't think of single reason not to induct the Bugatti Veyron 16.4 into our Fantasy Garage. Remember that price is not a barrier to entrance and we have the world's slickest team of mechanics. Though, if you were to actually purchase a Veyron for yourself, Bugatti keeps a mechanic on call 24-hours a day, ready to jet anywhere in the world. Serious like, this car rules. Special super-nerd, giant-geek extra pistonhead-points for anyone who can accurately explain why the car in the top picture is not a production Veyron. Now, vote!